Cub® Foods, a trusted hometown resource for fresh, quality foods in the Twin Cities for over 45 years, today announced the start of a month-long “Cub Days” customer appreciation campaign. Beginning this week through Oct. 11, Cub shoppers will be able to save big with aggressive promotions, and experience in-store fun with free samples and food demonstrations, major prize giveaways, local brand mascot appearances, and much more. Cub is holding the customer appreciation celebration to thank customers for making Cub the hometown grocer for over 45 years, and to officially welcome shoppers to the 10 new Cub stores recently converted from Rainbow Foods. Additionally, several customer events will take place at Cub locations throughout the Twin Cities area. These include visits from the Oscar Mayer Wienermobile, on-site sampling from multiple food vendors, and live onsite radio broadcasts. 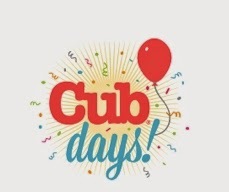 Details and a schedule of all “Cub Days” events will be available online atwww.cub.com/savings/Cubdays.html, as well as on Cub’s Facebook and Twitter pages.